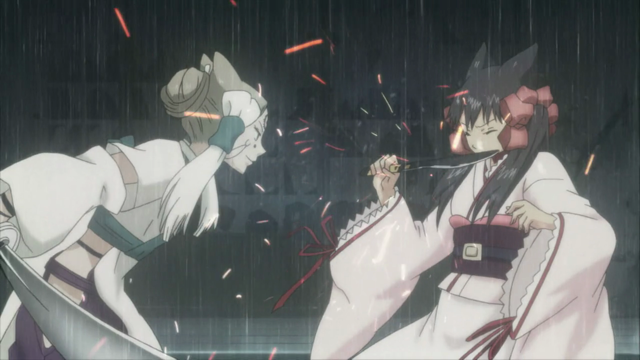 Zakuro’s enemies capture Agemaki and Susukihotaru in the eighth episode of Otome Youkai Zakuro. 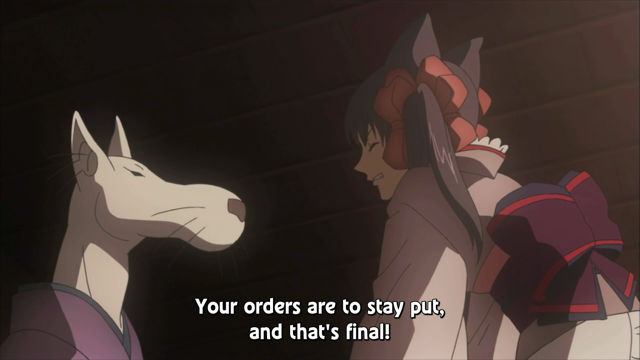 This leads to the first conversation between Zakuro and Riken, and further hints about the larger plot. The shopkeeper and her little friend are back for a brief appearance. 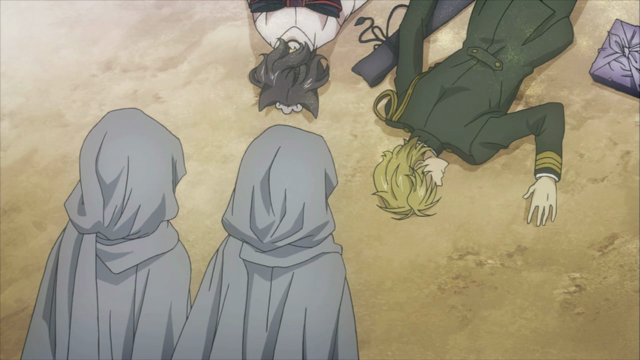 When Agemaki and Susukihotaru-san are discovered missing, Zakuro and Riken declare their intention to look for them. No doubt aware that this is a trap, her superior officer forbids Zakuro from taking part in a rescue mission. 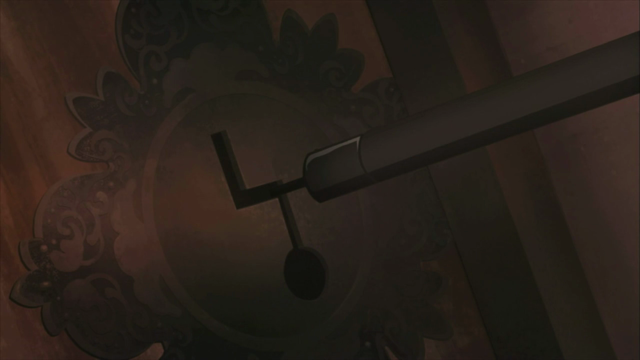 For good measure, Zakuro is locked in a room. One of the most interesting parts of this episode were the references to the “village of Oracles”. Zakuro’s superiors in the ministry of Spirit Affairs are shown to be aware of this place, from which the mysterious pair came. I think they should come clean with what they know. Obviously they are hiding something from Zakuro and the others. At this point lack of information has the team fighting at a disadvantage. Zakuro has been targeted, and her friends have been placed in great danger, but the superiors are withholding what they know about who and why. 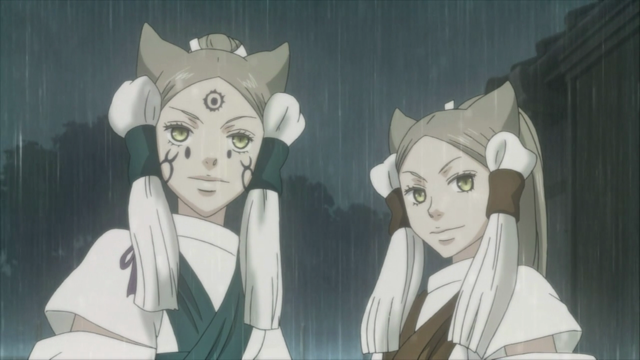 Our first good look at the mysterious pair, who turn out to be half-spirits, named Byakuroku (left) and Daidai (right). With some help, Zakuro breaks out and tracks her friends. Naturally a fight ensues. Before Zakuro can eliminate the threat, the Black Widow appears, and uses her talisman magic to help them escape. This episode ended with a very interesting scene at the Black Widow’s lair. We get to see more of her magical power, and the reprehensible attitude she has towards her servants. What we don’t get, is some clarification of why the Black Widow is fighting against Zakuro. Also, what is this Oracle Village? Is the entire village against Zakuro, or has the Black Widow twisted her servants into believing some extraordinary lie? Although it didn’t answer a lot, in fact it raised many new questions, this was an exciting episode with lots of development on several fronts. I’m really looking forward to the next one. That was a heartwarming ending. Also I’m glad Agemaki was buying Miss Z some sweets. That shows good character! Ahh! So many questions, and yet, this episode was strangely satisfying (strange because it was really predictable). 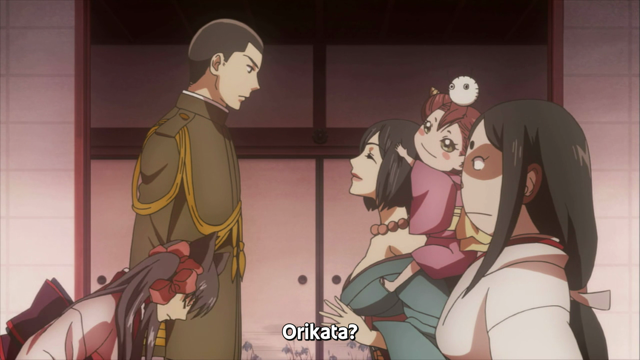 I think it’s because we got to see Agemaki man up and hug Zakuro when she needed it most. I hadn’t realized the woman in charge was actually the Black Widow and I do wonder what her plan is. Daidai is obviously in the dark about how the Dark Widow really feels about her, and if we’ve learned anything from her talk with the other sister, the Black Widow must be after Zakuro for some yokai experiment. 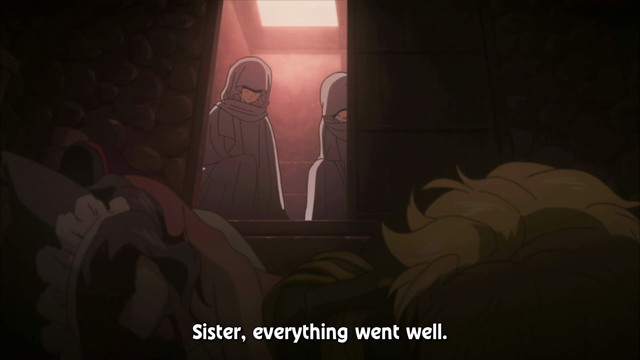 Yeah, I had thought, maybe the mysterious sisters were just using the Black Widow in their attack on Zakuro, but it seems the opposite is true. They’re doing a great job with this series. Clearly not the most important thing I’ve ever watched, but they sure are doing right by the material at hand!